Difference between revisions of "How did the Bubonic Plague make the Italian Renaissance possible?" The Black Death devastated Italian society in the middle of the 14th century. It led to great socio-economic, cultural and religious changes. After the initial horrors of the plague, Italian society, staged a spectacular recovery. Italy became richer than before. The impact of the plague reduced the influence of the Catholic Church as diminished, and the culture became more secular. The new social mobility meant that individualism came to be respected. The Black Death unleashed the forces in Italian society that made the Renaissance possible. The majority of the urban population in cities such as Naples were impoverished and lived in squalid and dirty conditions. These factors ensured that the diseases spread quickly and that there was a high level of mortality, among the poor, although even the rich could not escape the plague. From the cities, the plague spread like wildfire to the small towns and villages of the peninsula. There is no firm data on the impact of the plague on the population of Italy. However, some examples show the full extent of the disease in Italy. The plague halved the population of Florence. The population crashed and fell from approximately 100,000 to 50,000. The experience of Florence was replicated across all the major cities of Italy which also experienced similar drastic declines. The death rate in rural Italy was not nearly as high, but there was a significant loss of life. In general, the total population of Italy may have dropped by as much as a third. The Black Death was also an economic crisis as trade ceased because of fear of the spread of plague. As trade stagnated, businesses failed, and unemployment rose. The plague caused a complete social breakdown in many areas. Boccaccio in the Decameron, describes people abandoning their occupations, ignoring the sick and living lives of wild excess, as everyone expected to die. "Thus, doing exactly as they prescribed, they spent day and night moving from one tavern to the next, drinking without mode or measure, or doing the same thing in other people's homes, engaging only in those activities that gave them pleasure….. And they combined this bestial behavior with as complete an avoidance of the sick as they could manage." The social consequences of the plague on society came to be profound. The high mortality rate resulted in a drastic decline in the labor force.. Wages rose for both agricultural and urban workers. 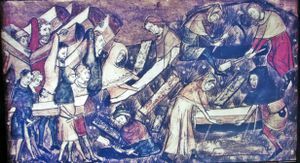 The survivors of the Black Death generally had a higher standard of living than before the plague. This was a phenomenon that occurred in both urban and rural areas. The crisis caused by the Black Death led to many changes in the economy, in response to the fall in the population. Because of the labor shortages, there was a move from labor-intensive farming such as cereal to livestock and increase both in industry and agriculture more labor-saving devices employed. The impact of the Black Death was contrary on feudalism in Italy. Feudalism was a system whereby peasants and farm laborers bound, as serfs, to serve a local lord. In the north of Italy, good farmland was plentiful, and wages increased, and the last vestiges of feudalism disappeared as serfs increasingly could purchase their freedom. In the south of Italy the opposite occurred, here, since the Norman kings, the aristocracy had been consolidating feudalism. After the Black Death, the elite responded to the labor shortages by strengthening the restrictions on the peasants and thereby strengthened feudalism in southern Italy. The consequences of the plague resulted in a growing divide between the North and South of Italy that persists to this day. In general, after a period of recovery, much of Italy became very wealthy as a more sophisticated economy emerged, especially in the North of Italy. This was crucial, as the increased wealth of Italy allowed the elite, such as the De Medici’s in Florence to become the patrons of great artists such as Michelangelo and Leonardo da Vinci. The result was a shortage of trained monks and priests. To deal with this, the Church hastily trained new monks and priests to serve the spiritual needs of the community, still coming to terms with the trauma of the Black Death. This meant that many unsuitable individuals became clerics and this led to a drop in standards among parish priests, in particular. The Church became corrupt and gradually over time lost the respect of many believers. In the short term the Black Death strengthened the Catholic Church in Italy, but in the long run, an increasingly corrupt institution meant that many people lost their faith. This led to the increasing secularisation of Italian society as many increasingly turned away from the church in disgust as the worldliness of prelates and priests. The contempt that many felt is evident in the stories of Boccaccio of venal and depraved priests, monks and nuns. The church had traditionally monopolized education, but after the Black Death, there was more secular education, especially in the cities. This was decisive in the emergence of the Renaissance, with its emphasis on human values and experiences rather than religion. The world was turned upside down by the Black Death. The mental outlook of people changed dramatically. Previously, people assumed that the world was fixed and God-ordained. The Black Death overturned old certainties. As we have seen the plague and its devastation undermined religious orthodoxy and beliefs. People at the time were no longer willing to accept the status quo. This change manifested in the numerous political revolts of the time. The most famous of these, led by the poor workers and weavers called popularly the Ciompi, that took place in Florence in 1378. For four years, the poor formed the government of the city. The revolt was one of several in Italy at the time. No longer are people as willing to question the old ways of doing things and no longer accepted things because they were sanctioned by tradition. The Black Death led to a great questioning of the old certainties. This led many, especially among the urban elite to use reason to understand the world. They also increasingly turned to the classics to find answers to the problems of life. The new spirit of inquiry helped to ignite the Renaissance, especially in politics and philosophy. However, that is not to say, that Italy rejected all traditions, it was still a very conservative society in many ways. 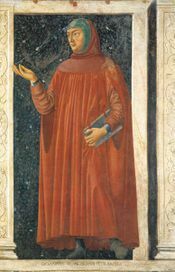 However, those who questioned authority and the received wisdom, such as the Poet and Scholar Petrarch inspired the Humanist movement, which valued reason and critical thinking. 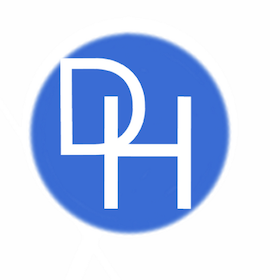 The Humanist are essential in the development and progress of the Renaissance. Initially, the Black Death led to a fascination with death among many Italians. The loss of life and the suffering led many to become obsessed with death. 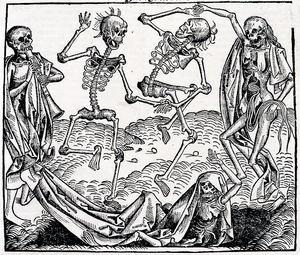 The Dance of Death was a popular motif in art and architecture at this time. The general mood was one of pessimism, and indeed many expected that sooner or later that the world would end. Alongside this fear of death and the general mood of pessimism, there was a desire to experience the pleasures of life and to seize any happiness that was on offer. This contradictory impact of the Black Death on the culture of the time can be seen in the writings of two of the greatest figures in European literature, Petrarch and Boccaccio. These two writers at times wrote in despair about the human condition yet they also wrote about the joys of life and the beauties of nature. 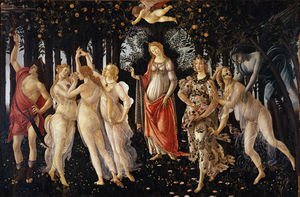 This sense that life was fleeting and that every happiness should be seized, led many Italians to seek solace in art and literature and this was one of the factors in the development of the Renaissance. Many of the elite were eager to enjoy the pleasures of life, and this led them to patronize artists. It also resulted in a shift in the themes of artists. Religious topics remained popular, however, there was also a fascination with secular themes, especially from the classical world. The new interest in secular subjects can be seen in a comparison between Giotto and Botticelli. Giotto painted almost exclusively religious paintings. While Giotto, painted both secular and religious themes, indeed he is best known for his secular works as in masterpieces such as Primavera. The plague disrupted society to an unprecedented state. It overturned the existing social structure. Previous, to the outbreak of the plague, Italy was a rigid and stratified society. The Black Death changed everything. Increasingly, because of the demographic disaster caused by the plague were able to take advantage of the opportunities caused by the high death rate. In the period after the Black Death, an unprecedented amount of social mobility took place. Laborers became merchants and merchants become members of the nobility. No longer was a person’s destiny to be fixed by their birth. Previously, people assumed that one’s station was fixed at one’s birth and that one had to remain a member of the class you were born into. People believed that a peasant would always be a peasant, an aristocrat, and aristocrat. Italians, like other peoples, in Europe, believed that one’s birth determined one’s future and that this was determined by God. However, as social mobility became more widespread because of the Black Death, many people, came to believe that a person’s merits or abilities were what mattered and not one’s birth. This led to a growing individualism in Italian society. This, in turn, encouraged people to strive and to develop their talents and achieve excellence or virtue. The belief in the individual was central to the Renaissance and it inspired many of the greatest artists, architects, sculptures and writers, the world have ever seen to create peerless works. One group that was adversely impacted by the Black Death was the nobility. This was also the case in many other European regions and kingdoms. The nobility suffered as much as many others classes as a result of the plague and many families died out during the period. In the aftermath of the epidemic, they found themselves in serious financial difficulties. The loss of population meant that there was no longer a high demand for their land and rents fell. Many of their laborers simply left the land, and they were not replaced. Many of the nobility found themselves obliged to sell their serfs their freedom or to sell land to merchants from the cities. At this time, many wealthy merchants purchased new estates. The demise of the traditional elite meant that a new elite came to the fore, composed of merchants and self-made men. This new elite often keen to patronize arts. They were very conscious of their lack of birth and humble origins. They were keen to use art and to patronize men of letters to compensate for lack of traditional authority. In order to appear the equal of the old aristocracy, they sought to sponsor artists who would win the esteem of the public. This was one of the reasons for the lavish patronage of the de Medici’s in Florence. They were keen patrons of the arts, to justify their status in society and to impress the general population. This meant that the great artists had many patrons, who often competed for their talents and this allowed them to concentrate on their art and to produce some of the greatest art, ever known. What was the impact of Charles VIIIs invasion of Italy (1494) on the Renaissance? ↑ Burckhardt, Jacob (1878), The Civilization of the Renaissance in Italy, trans. S.G.C Middlemore, p. 14. ↑ Pullan, 1973, p. 156.